Eddie Izzard has been hailed as one of the foremost stand-ups of his generation. He takes ideas and situations and extrapolates then into bizarre, tangential, absurd and surreal comic narratives. Since his first stage appearance on London's West End in 1993 there have been a succession of sell-outs and critically acclaimed international tours. Eddie's musings have earned him countless awards including two Emmy Awards. Whilst initially renowned as a comic, Eddie is also now equally respected as a film, Theatre and TV actor. Eddie Izzard - Wunderbar website. Between 15th September 2019 and 16th November 2019 this tour will visit 19 venues in Bexhill-on-Sea, Birmingham, Brighton, Glasgow, Nottingham, Oxford, Plymouth, Newcastle upon Tyne, Leeds, Edinburgh, Norwich, Cambridge, Sheffield, West End, Cardiff, Liverpool, Manchester, Belfast and Dublin. Current and future dates only. You can embed this tour information on your own website by adding a single line of code to a page and using the Qtix code T550047010 - for details see our Embed Information page. 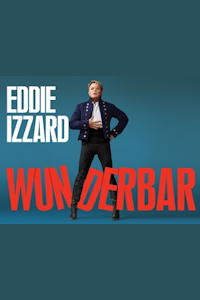 Receive email notifications of changes to Eddie Izzard - Wunderbar.